The other name for straight slots is flat rate slots. This type of slot machines offers the payouts for certain bets and symbol combinations that are stated in the payout table on the front of the machine. It means that the payouts for straight slots are actually unchanged. Straight slots are not linked to other slot games. This means that the jackpots for each machine are unique for every given straight slots machine. The chances of winning are fairly high when you play straight slots, but in fact straight slots offer lower prize money compared to that in progressive slots. Multiplier slots. This type of straight slots offer payouts based on the total number of coins that are wagered for each spin of the reels. For example, if you insert one coin and the machine pays 5 coins for a combination of three identical symbols, like cherries, you may win 10 coins if you bet two coins. Thus, a payout is increased due to the number of coins you insert in the slot. However, it is recommended to avoid playing with maximum coins. Bonus Multiplier slots actually work according to the same principles as the regular Multiplier slots. The difference here is that the machine introduces a special bonus that increases the slots payouts for winning symbol combinations in case the player bets maximum coins. To use the previous example, you might win 30 coins if you bet 3 coins for the combination of three cherries. Multi-Payline slots. Most modern video slots offer multiple paylines for the players to bet on. In Multi-Payline straight slots, every next payline is activated by means of inserting additional coins. For example, you may insert one coin and in case the winning combination on the line that wasn't activated comes out you will get no payout. Buy-a-Pay slots. This type of straight slots offers payouts for winning combinations only in case you insert sufficient amount of coins for a certain combination. For example, if you insert one coin and the machine hits the winning combination of three sevens that is supposed to "cost" 2 coins, you won't be paid. 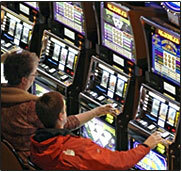 Some straight slot machines offer the mixture of features specific for other types. One of the basic recommendations on how to play slots is to always get acquainted with the slot payouts tables for the machine you are going to play before you actually start playing. This way you are sure to bet sufficient amount of coins to get the needed payout while playing straight slots.